Our little Megsie officially turns one today! 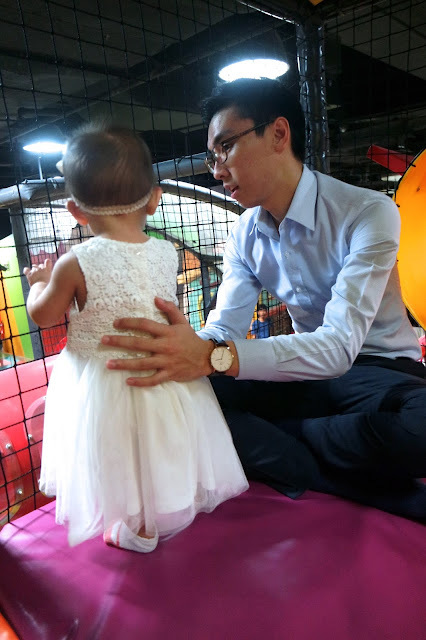 & to mark her 1st year, here's a blogpost on her first birthday party that we celebrated at eXplorerkid @ Downtown East, E!hub almost a month in advance because of Shane's overseas exercise! eXplorerkid was kind enough to sponsor the party venue for our usage and even helped plan and coordinate the whole event! I'm VERY THANKFUL for eXplorerkid's help with the whole party planning because I already had so much on hand to worry about ( the wedding, preps for Shane's deployment etc. ) and I was legit stressing out over those things already but with eXplorerkid seeing through the whole process of planning Megan's party, I didn't even have to lift a finger or worry at all so that was a whole load off my shoulders! All I had to do was arrive at the venue that day and enjoy the day with Megsie! We had this cute little private party "house" within eXplorerkid all to ourselves for 2 hours! Inside when we arrived, the party room was decked in hues of pink and purple for a Princess, Tutus & Tiaras themed birthday party for our little royalty! & of course, no princess party is complete without a tiara! Each of our little guests had one to themselves as well as a little box of treats all sponsored by eXplorerkid as part of their Premium Plus Birthday Party Package! Megan's birthday party package also came with lots of goodies for the kids to bring home! Because what's a birthday party without a goodie bag right?! Before all the fun and games started, our guests had their tummies filled and the kids even had their own specially prepared meals of pasta and finger food like nuggets and fishballs! Yum! & even though it was Megan's birthday, Kylie herself had such a swell time it almost felt like it was her birthday! You can tell just how happy she was that day from that smile! If you're thinking to yourself "Huh, 2 hours of party room usage only?" well, but that's not all! Our guests had ACCESS AND UNLIMITED PLAYTIME TO THE ENTIRE EXPLORERKID PLAY AREA FOR THE WHOLE DAY!!! with a mini ball pool for the younger kids! Can I just say, I really love how the whole of eXplorerkid @ Downtown East is completely padded so I don't have to worry about Megan falling when she loses her balance! & if you have the extra budget, you can treat your little thrill-seeking guests to test their guts at the Adventure Highlands! Even the birthday princess, Megan had her nails painted (you can see that she has red nails in some of the pictures below!). Did I also mention, that adults can enter the Mega Play maze too?! our two party coordinators simply made an announcement over the intercom and had all the kids gathered back into our party house in no time! Since Megan was the birthday girl, she had the first go at it - with the help of her daddy of course! Love seeing the kids rush for the candies once the piñata breaks open! & the delight in their faces after grabbing their loots! & of course, to end of the party, we had the mandatory "sing-song-cut-cake" session with our amazingly pretty princess cake proudly sponsored by Ana Sue Salim! & plenty of love from big sister Kylie! Megan was so thrilled even she was clapping away to the chorus of kids singing her birthday song! It's almost impossible to take a proper family shot with both kids looking at the camera these days! Meg the foodie who couldn't wait to cut and devour her cake! & by the end of the party, our little princess was spent! While we headed back home, some of our guests still stayed behind to make full use of their unlimited playtime! So glad to hear so many parents tell us how their children really enjoyed themselves! Best children's party venue everrrr!!! Megan even went home with a little something from eXplorerkid for her birthday! So once again, Shane & I would really like to thank our sponsors, eXplorerkid & Ana Sue Salim for making Megan's 1st birthday such a wonderful success! We definitely couldn't have done it without you!! HAPPY 1ST BIRTHDAY PRINCESS MEGAN!!! WE ALL LOVE YOU SO VERY MUCH!! !